THE Gulf’s one-stop shop for the construction, interiors and real estate sectors raises its shutters once again for another edition of the 3Gs – gulfBID, gulfInteriors and Gulf Property Show. 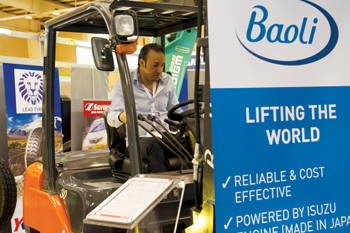 The event takes place at the Bahrain International Exhibition and Convention Centre from May 12 to 14 and is expected to draw a diverse range of exhibitors from the three sectors and an unprecedented number of business visitors seeking to acquaint themselves with the latest advances and trends. The Gulf continues to be the scene of hectic high-investment infrastructure and construction activity, reason why manufacturers of building materials and interior decoration products, architects, consultants, contractors and traders and managers would be interested in a showpiece that encompasses as broad a panorama as the 3Gs do. gulfBID 2015 has attracted a number of companies from Saudi Arabia including Al Koblan Thermopipe, Al Rezayat Protective Coating, Gulf Scaffolding Company, Al Dweik Factory, Plastbau Arabia Company, Concrete Technology, Riyadh Crane Technology, Shade Technology and Bonar Natpet. “These companies are not only looking to access the opportunities of the Bahrain market, which itself is embarking on some major projects over the coming months, but are also looking to take advantage of Bahrain as a Mice centre to meet new and existing clients and principals,” said Jubran Abdulrahman, managing director of Bahrain-based Hilal Conferencess and Exhibitions (HCE), organisers of the show. The Saudi companies attending gulfBID will be displaying the latest technology in building fabrics, concrete products polystyrene building blocks, scaffolding, PVC tents and steel structures and cranes. The 3Gs will be held under the patronage of His Royal Highness the Prime Minister, Prince Khalifa bin Salman Al Khalifa. Last year gulfBID attracted 7,100 local and regional visitors and expectations are that the turnout this year could be more impressive. “The business value of gulfBID is seen through the strategic sponsorship given to the event by Haji Hassan Group and KMC Holdings,” said Abdulrahman. Bahrain-based Haji Hassan Group covers 13 sectors specialising in the manufacturing of construction materials, road infrastructure, bridges and flyovers projects and real estate development, while Bahrain-based KMC Holdings provides total solution packages from KMC’s various divisions for the construction sector. “We are a regular exhibitor at gulfBID. This year, we have taken our level of participation to that of strategic sponsor because we feel that association with this exhibition very much fits in with our philosophy of excellence,” Haji Hassan Group general manager for administration Fouad Al Hamad said. Haji Hassan will showcase at gulfBID products and services from its portfolio of joint venture partners and divisions including Bahrain Precast Concrete, Bahrain Blocks, Haji Hassan Ready-mix, Arabian Chemical Industries (ISOLA), Haji Hassan Reinforcement, Arabian Parts Company and Bahrain Pipes. 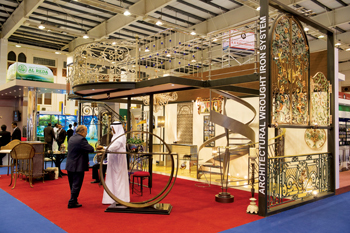 “Its products and expertise are a valued contribution for visitors attending the gulfBID exhibition,” Abdulrahman said. Kuwaiti Manager Building Materials & Equipment, a subsidiary of the Kuwaiti Manager Holding Company (KMC), will be present as a strategic sponsor of gulfInteriors Exhibition. Providing its specialist design capabilities for regional and international clients, KMC represents some of the world’s leading brands. Engineer Fadi Al Shaikh, KMC deputy general manager, said: “In gulfInteriors exhibition we see an excellent showcasing opportunity to promote KMC Building Materials’ full design capabilities as well as providing a platform to introduce our portfolio of leading brands from around the world. At gulfInteriors KMC will feature a range of brands including Babini Spa office furniture from Italy; Wagner (Germany); Topstar; LE-AL executive office furniture; Hermann Miller; Steelcase and Kimball; Poltrona Frau; and Humanscale. An exhibitor at the gulfInteriors wing will be Creative Closets, one of Saudi Arabia’s leading interior manufacturers of storage solutions. Established in 1997, it specialises in household storage systems with such products as walk-in and reach-in closets, space saving wardrobes, bookcases, TV cabinets and pantries. “Our goal is to maintain our reputation as one of the Middle East’s leading manufacturers of storage solutions,” said Creative Closets commercial manager in Bahrain Tarek Shaltout. The company currently operates 15 showrooms including four production facilities across the Middle East. “Companies such as Creative Closets are exciting innovative exhibitors who are capable of handling any project from luxurious housing complexes to an economical commercial facility,” said Abdulrahman. Gulf Property Show has a regional reputation as a unique marketing platform for commercial and residential property developers and real estate service providers. The 2015 edition enjoys the backing of the Bahrain Property Development Association (BaPDA) and the Middle East Facilities Management Association, reflecting value to the sector. Diyar Al Muharraq, Bahrain’s major urban developer and a strategic sponsor of the show, offers a range of housing options and lifestyle options for all income brackets. Having recently completed land reclamation for 12 man-made islands, the company is now entering the exciting phase of developing the area. “Diyar Al Muharraq is internationally acclaimed for its progressive architectural style and its eco-friendly approach to projects,” Diyar Al Muharraq chief executive Dr Maher Al Shaer said. “The Gulf Property Show plays an important role in promoting Bahrain’s real estate sector not just within the country but across the wider GCC and internationally,” said BaPDA chairman Aeref Hajres. 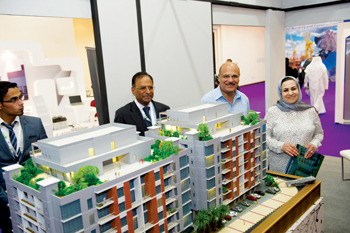 “The Gulf Property Show has caught the imagination of leading international as well as regional exhibitors from Turkey, the UAE, Malaysia and the UK, with additional real estate opportunities being exhibited from Cyprus, Bosnia, the US and Spain,” said Abdulrahman.